It’s been a fun spring semester. Brent McKee and I have been leading two seminar classes at Chapel Hill. One looks at sediment accretion in North American estuaries across the Anthropocene and the other is more broad, titled Frontiers in Marine Geology. Carson Miller, Molly Bost and I presented research at the Ocean Sciences meeting in Portland Oregon. We also had time to explore the surrounding geology. 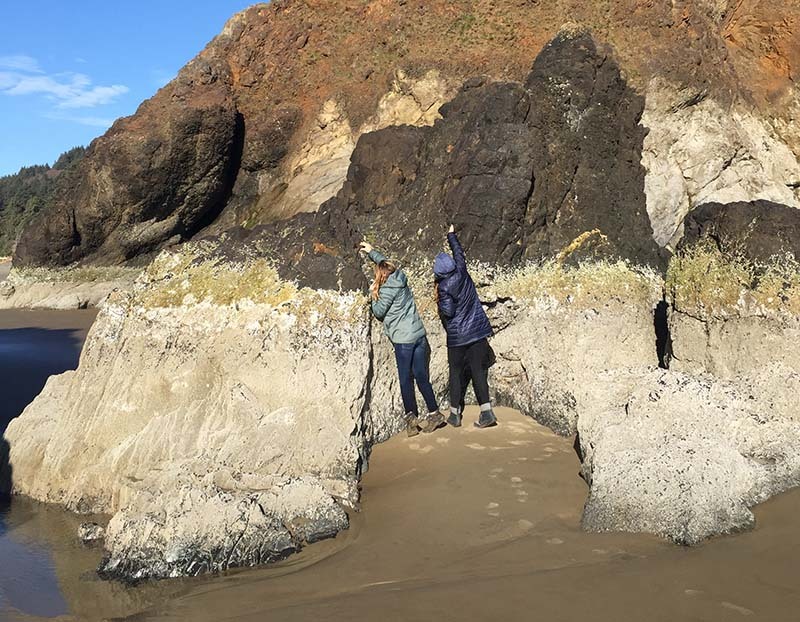 Getting to know the rocky intertidal along the Oregon coast. 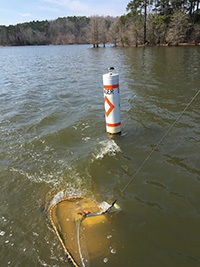 In March Molly, Carson and I collected some Chirp sonar data in Jordan Lake, NC. This reservoir has some problems with water quality and perhaps resuspension of bottom sediment is contributing to the poor water quality. We are mapping sediment thickness to identify the best spots for sampling. 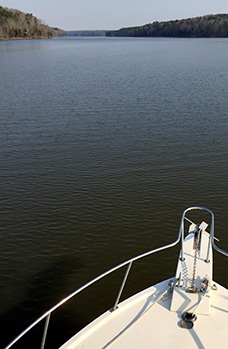 Jordan Lake is a beautiful recreation area. Towing the Chirp tow fish. It’s important to collect data close to markers, even if they are labeled “Danger”. Charlie Deaton and Anna Atencio just submitted their theses to the graduate school. That was the last hoop to jump through. Both will soon have Master’s degrees from UNC. Great job. 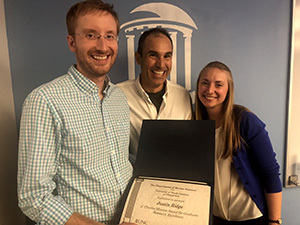 On Oct. 1, Rodriguez Lab alum Justin Ridge was presented with the J. Charles Morrow Award for Graduate Research Excellence, in recognition for his accomplishments during his PhD. Jessie Straub, current MS student, gave her research seminar to the department directly after the ceremony. Big Day. 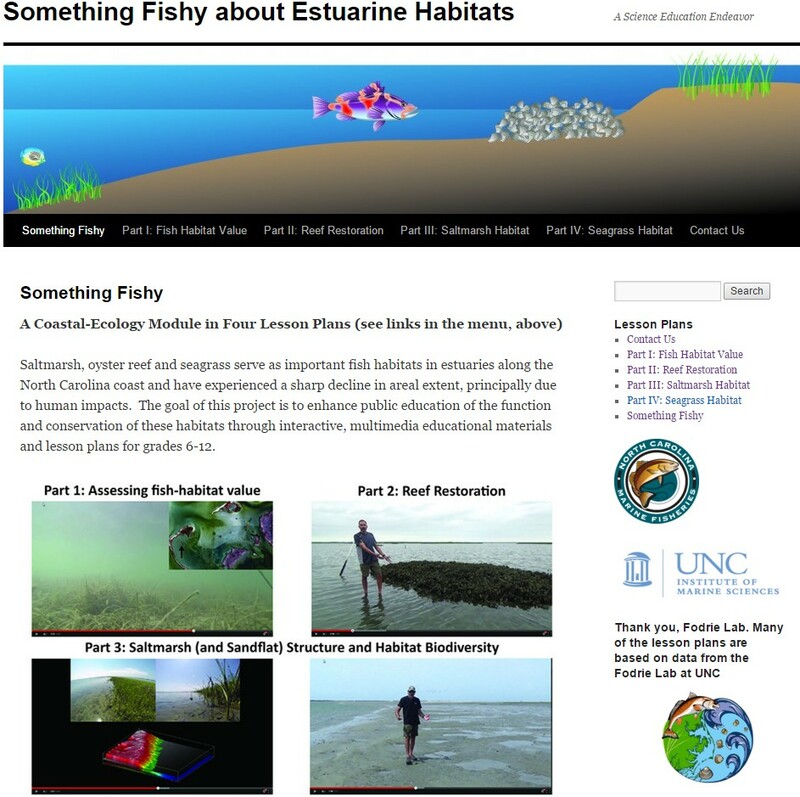 Lesson plans for middle- and high-school teachers that focus on estuarine fish habitats can be found here.